Are You Making One of the Most Common Hoof Care Mistakes? There is great truth in that short sentence. Yet many horse owners make simple mistakes that can compromise the health of their horses’ feet, interfering with their riding and performance goals. To learn the three most common hoof care mistakes, we turned to Tom Curl, a specialist farrier based in Vero Beach, Florida. Curl focuses on sport horse lameness and travels extensively to work on challenging cases. Recognized worldwide as an expert in patching quarter cracks and using glue-on shoes, Curl has worked on many prominent horses, including repairing the quarter cracks that plagued champion Big Brown, winner of the 2008 Kentucky Derby-G1. Curl has been a farrier since 1972 and was inducted into the International Horseshoeing Hall of Fame in 2006. Curl urges owners to pay attention to the following areas to give horses the best opportunity for soundness. “All three are intertwined and part of the essential equation for healthy hooves,” he notes. Daily observation — including picking out all four hooves — is one of the easiest ways to know what’s happening with your horse’s feet. Many owners only clean hooves when it’s time to ride or before the farrier arrives. Develop a regular hoof care program and stick to it, but evaluate it throughout the year in case changes are necessary. For example, your horse may require hoof conditioner at certain times of the year, but not year round. During wet seasons, your farrier might suggest using a hoof product that fights bacteria. Daily observation, including picking out all four hooves, is the best way to know what’s happening with your horse’s feet. Regular care includes routine visits from a hoof care professional, whether your horse wears shoes or is barefoot and just needs trimming. The time between visits may vary slightly, depending on your individual horse, how often you ride, time of year and region. Hot, dry, sandy conditions pull moisture out of the hoof, while wet, muddy turnout softens hooves, which can allow bacteria to invade. You want to cast a critical eye on the bedding in your horse’s stall. 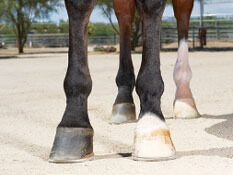 Nutritional deficiencies invariably show up in a horse’s feet. Talk with your veterinarian and farrier to create a nutrition program that fits your horse’s specific needs. Follow label recommendations and feed a commercial balanced ration that targets your horse’s activity level, age and requirements. “Nearly every horse can benefit from a supplement meant to improve hoof quality and growth,” says Curl, who advises giving a supplement 60 days before evaluating how well it’s working. Ingredients such as methionine, lysine, lecithin, biotin, calcium, phosphorus, copper, zinc and protein help strengthen hooves and promote growth. Read labels to check for these ingredients when shopping for a hoof supplement. Be sure to follow directions and feed the proper amount for your horse's weight.